Can White Rice Cause Diabetes? 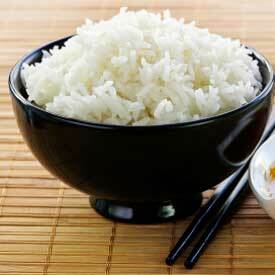 A study held by the Harvard University on more than 350,000 people had shown that frequent consumption of white rice increases the risk of Type 2 Diabetes. This risk was even higher on the subjects that consumed bigger quantities and the results were the same on Asian people living in China, Japan, United States or Australia. The risk of developing Type 2 diabetes increases by 11% with each bowl of white rice you consume daily and this risk is higher on Asian populations compared to the rest of the world. The study followed the evolution of the subjects over a period of 22 years, and none of them had diabetes when the study began. Although Asians are consuming high amounts of white rice for thousands of years, this risk increased lately due to the consumption of white rice combined with other sources of refined carbohydrates such as white bread, pastries and sweetened drinks. In case you are looking to lose weight in a healthy way, we definitely recommend one of the most popular weight loss books on the market - "Burn The Fat, Feed The Muscle" by Tom Venuto.